After nearly two years, thousands of truck miles and $12.5 million in storage costs, a cold relic of the flawed Hurricane Katrina relief effort is going down the drain. The federal government is getting rid of thousands of pounds of ice it had sent south to help Katrina victims, then north when it determined much of the ice wasn't needed. The Federal Emergency Management Agency had been hanging on to the ice in case it was needed for another disaster, but decided to get rid of it because it couldn't determine whether it was still safe for human consumption. "We just didn't take any chances," FEMA spokeswoman Alexandra Kirin told the Gloucester Daily Times. The ice, held at AmeriCold Logistics in Gloucester and at 22 similar facilities nationwide, is being melted. 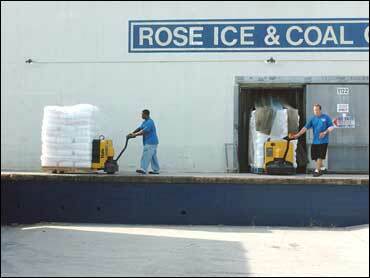 The cost of storing the ice at all the facilities since Katrina is $12.5 million. The Army Corps of Engineers acknowledged after the August 2005 hurricane that it had ordered too much ice because of faulty estimates by local officials. Truckers received up to $900 a day to move the ice to storage sites around the country. Gloucester received 118 truckloads of ice that September, but 99 of those were sent to Florida in October 2005 to help with relief efforts after Hurricane Wilma. By November 2005, only four truckloads, weighing between 40,000 and 84,000 pounds each, remained in Gloucester. FEMA contracts required disposal of the ice three months after purchase, but Kirin said the agency decided to keep the excess ice for the 2006 hurricane season. With fewer storms than expected, the ice was not needed, and the agency decided not to save the ice for the 2007 season. She added that FEMA tried to donate the ice, but "had no takers."